"The Hedgehog Chalet" has a beautiful location with breathtaking views of an evolving panorama over the seasons. Slightly away from the village center of Bonlieu 39130, in the middle of a large lot, the calm and tranquility so much sought is assured. Ground floor: large living room with wood stove, a TV room convertible into bedroom with sofa bed (good mattress) 160/200, dining room and kitchen area, 1 bedroom with a bed of 160/190. shower room with WC. Direct access to the terrace and the ground. 1st floor: 2 bedrooms, one with 1 bed of 140 and 1 bed 90, the other with 2 beds 90 joinable, a large landing with bathroom and toilet. In the basement garage, laundry room with washer, dryer and freezer. ... Hedgehog waterfalls at 800m. During the school holidays the bookings are from Saturday to Saturday. Bathroom with shower no tub. the house was great, the views were fantastic, the sunsets were beautiful and the night skys were amazing. It's our first time in the Jura and it was altogether a great great holiday - loved it ! A truly amazing property with the best facilities and surrounding nature. 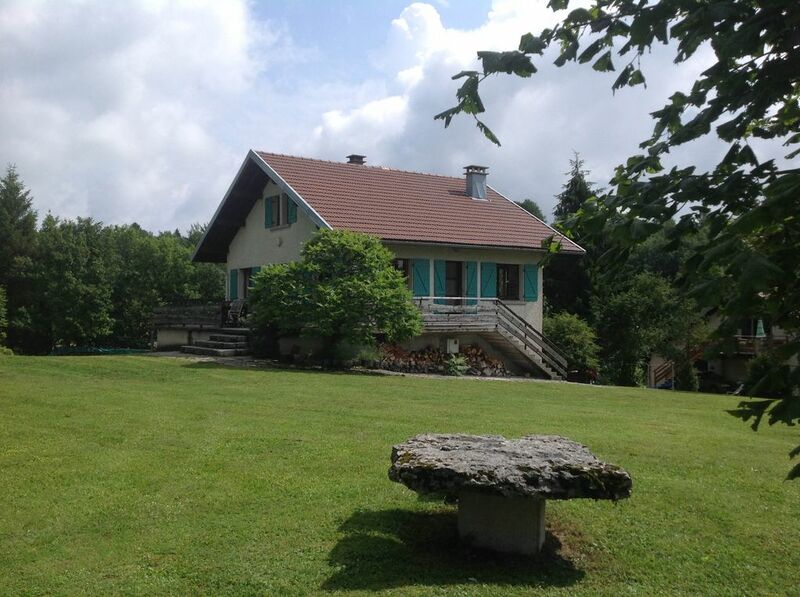 The chalet is located in the most beautiful area of the Juras close to nature trails, lakes, vineyards etc. The chalet is roomy with all the appliances, furniture and things you would want in your own house. We had the pleasure of meeting Nicolas and his wife Claudine. A truly great and kind couple who we shared a good hour with. The most amazing thing of all was the view from the chalet. Its location is perfect on top of a hill overlooking Bonlieu and a wide view of the area facing westward. So we had the most incredible sunsets that we watched every night. The property is excellent. Very well equipped and great for kids with table tennis and large garden. Amazing views and very well situated for the lakes and cascades. Although it is near other houses it is very peaceful. Nicolas and Claudine gave us a warm welcome. Love to come back! Thank you very much Matt, is with great pleasure that we will welcome you again , there is so much to visit in our beautiful region .